Product prices and availability are accurate as of 2019-04-22 19:34:58 EDT and are subject to change. Any price and availability information displayed on http://www.amazon.co.uk/ at the time of purchase will apply to the purchase of this product. Our twin sleeper is the perfect addition to child's bedrooms. Perfect if you need to save space. The top and bottom bunks are both standard 3ft Single beds. Twin sleepers are great for children who want sleepovers but don't have the space. 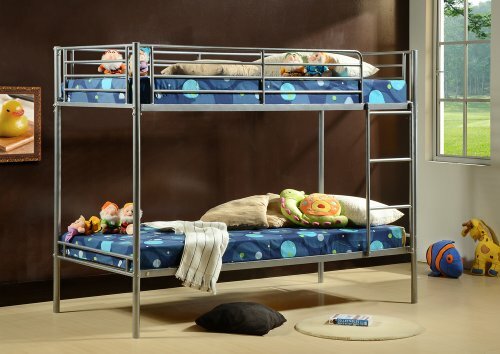 The metal tubular rails give this bunk a contemporary, modern look. The top bunk has the all important safety rails, to put your mind at rest, with the same tubular design. The ladder is fixed to the right hand side. •DIMENSIONS: W99cm x L202cm x H171cm •UNDERBED CLEARANCE: 30cm •BETWEEN BUNKS: 90cm This bed comes flat packed for simple home assembly, all tools and instructions included. If you require any further information please do not hesitate to contact us.